Hello friends! 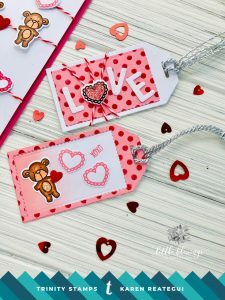 Today I’m up at Trinity Stamps blog sharing a Valentine card and matching tags. 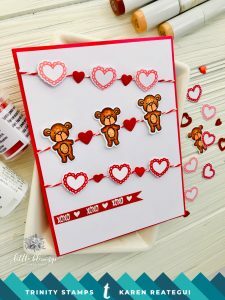 I’m featuring the Seasonal Sweetheart Stamp and dies. Let’s begin! I started by stamping the bears onto Neenah Classic Crest Solar White 80 lbs. using VersaFine Onyx Black and heat embossed it with WOW Clear embossing powder. 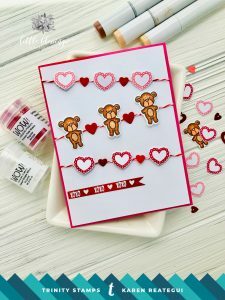 Then, I colored the bears with Copic markers and die cut them using the matching dies. 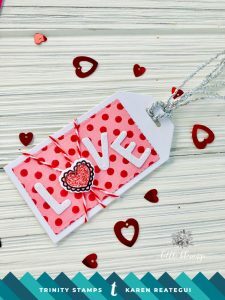 Next, I stamped the hearts using Worn Lipstick Distress Oxide ink and heat embossed them with WOW Clear embossing powder. I also, stamped more hearts using Versamark ink and heat embossed them with WOW Primary Pink Robin embossing powder. I die cut the hearts using the coordinating dies. I added 3 pieces of withe and red twine to a white panel and secured at the back. On top of each twine I put the small images using glue dots. Finally, I stamped the sentiment on red cardstock using WOW Opaque White embossing powder and added it to the bottom of the panel. Lastly, I placed the panel on top of a fuchsia card base. For the tags, I added Worn Lipstick Distress Oxide ink to a piece of white cardstock. Once it was dried I stamped dots all over the cardstock and heat embossed using WOW Primary Pink Robin embossing powder. Then, I placed a tag die on top and run it through my die cutting machine. I cut off the center of the tag and reserved this piece. I die cut another tag out of white cardstock and adhered to the back of the embossed tag. Next, I glued the images on top and stamped the word xoxo. For the other tag, I added some white and red twine and the letters for LOVE. 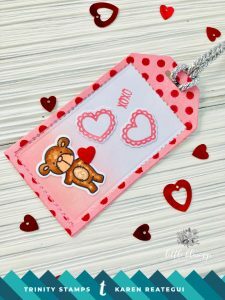 Hope you like this lovely card and cute tags. 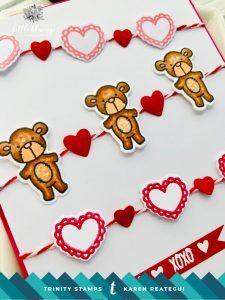 Please stop by Trinity Stamps Blog to leave some love to the other designers today. Also, you can get the stamp used in this project at Trinity Stamps Website. Please have a blessed day and enjoy your weekend!